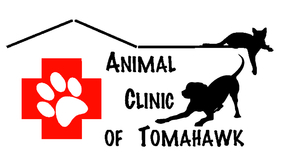 The Animal Clinic of Tomahawk is tucked away off of North 4th Street in Tomahawk. The parking lot is shared with two other local businesses: Remax Properties-North and Generations Funeral Home. The boarding entrance is facing North 4th Street. The clinic entrance and parking is at the rear of the building.